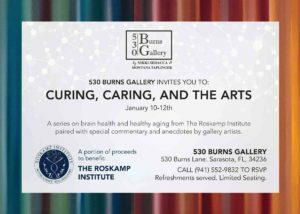 Hosted by community partner 530 Burns Gallery, a series on brain health and healthy aging from The Roskamp Institute paired with special commentary and anecdotes by gallery artists. 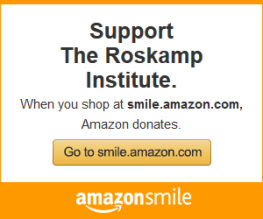 A portion of proceeds to benefit The Roskamp Institute. 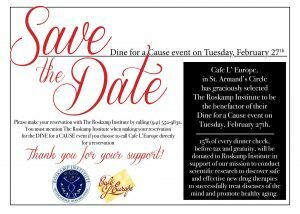 Cafe L' Europe has graciously selected The Roskamp Institute to be the benefactor of their Dine for a Cause event on Tuesday, Feb. 27th. Please call our Dine for a Cause Reservation line at (941) 552-9832 to make your reservation. 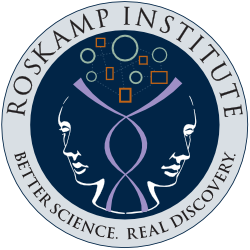 *If you choose to call the restaurant independently you MUST mention the Roskamp Institute when making your reservation in order for it to count! 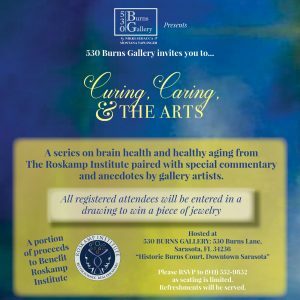 A series on brain health and healthy aging from The Roskamp Institute paired with special commentary and anecdotes by gallery artists.